The city of Busan, beautifully situated next to the Nakdonggang River and Geumjeongsan Mountain, continues the fair and equitable spirit of the Gaya and Silla cultures with a keen vision to further national self-interests and the cultivation of democracy. Busan, located in the very heart of Northeast Asia, is the maritime gateway to the Asia-Pacific rim group of nations and serves as a major bridgehead to the Northeast Asian continent. 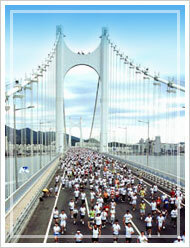 Busan is widely supportive of talented people in every field of human endeavor. We are proud to be citizens of Busan. We will strive towards a bright future for our city with a dynamic spirit that contributes to the prosperity of Busan, to the nation as a whole and to the general welfare of mankind. We will develop Busan into an admirable society which gives priority to human rights and improves the well-being of all its citizens. We will develop Busan into a just and equal society where law and order are well-observed. We will develop Busan into an eco-friendly society where all living beings are cared for. We will develop Busan into an open society which values innovation and creativity, while maintaining and respecting traditional culture. We will develop Busan into a society where all citizens can live in peace in order to serve the city as one community.